This bra is very comfortable and accommodates much fuller breasts than the listed sizes from Belly Bandit. Small works well for 32 and 34 bands and can stretch to accommodate up to UK GG (US J) breast sizes. Medium is great for 34 to 36 up to about GG cups, etc. 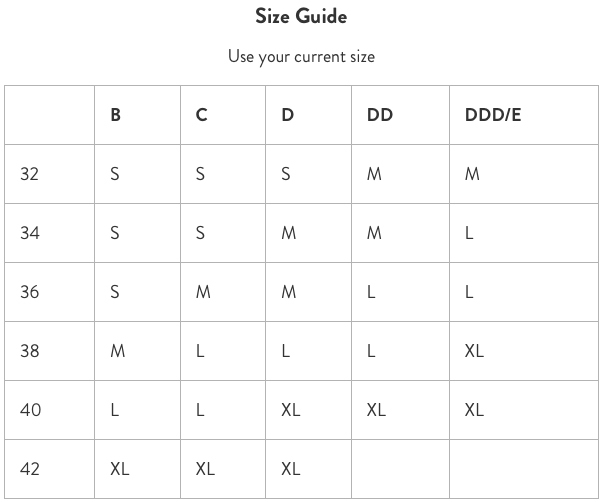 Basically, if you fall between band sizes but have breasts sized GG or slightly larger, you should go up to the next size to give yourself some room in the bust where you need it. I will say that although the removable pads give a nice, round, forward shape, they are very thick and will be visible under thin shirts. Either be prepared to take them out for a smooth fit, or wear a tank or layering shirt to hide the ridge where the pad stops and your breast starts. The removable contour pads of the Belly Bandit Bandita Nursing Bra #NB mold to your bodys new shape and a simple release feature means baby can easily access your breast for a stress-free latch on. Great for sleep, nursing and everyday wear, this anytime bra has everything. Made from super soft, breathable fabric, our seamless and wireless bra is designed to grow with you during and after pregnancy. Manufacturer Recommended Washing Instructions: Hand wash cold. Lay flat to dry.